Jazz in Bethel, fourth in the successful ‘Jazz is Back’ series presented by Bethel Arts. The Cultural Alliance of Western Connecticut is fiscal sponsor for Bethel Arts. 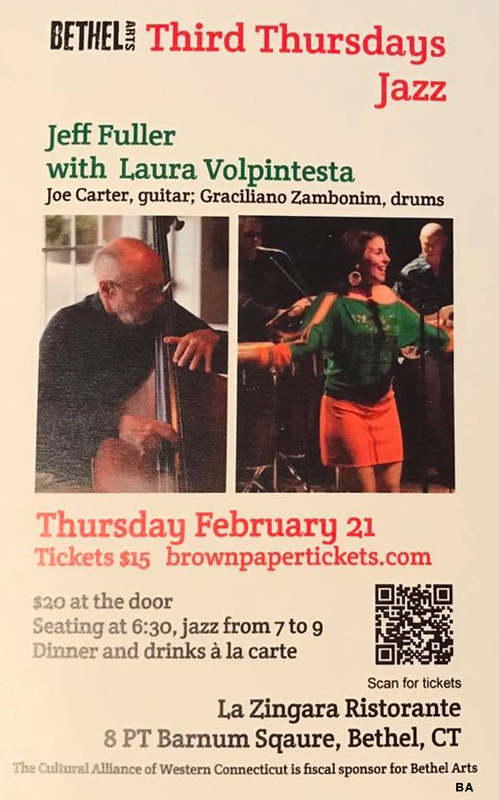 Vocalist Laura Volpintesta (Bethel’s very own) performing with the renown bassist Jeff Fuller, featured guitarist Joe Carter and Percussionist Graciliano Zambonin! 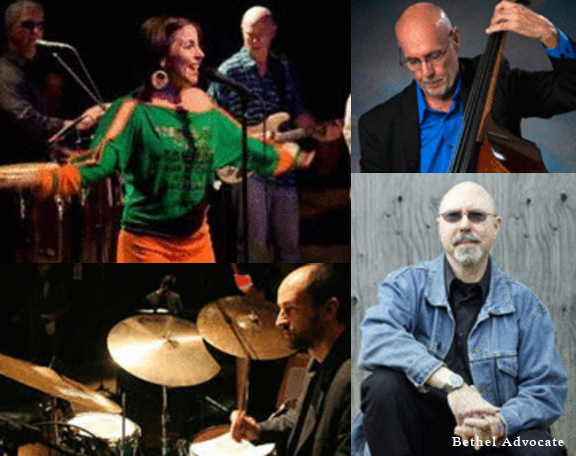 Thursday, February 21, 2019, seating 6:30PM, jazz 7-9:00PM, La Zingara Restaurante, 8 P.T.Barnum Square, Bethel, CT.
Brazilian Jazz Tickets On Sale … Music charge $20 at the door, dinner and drinks à la carte … Purchase tickets here. Jeff Fuller, Bass.Jeff has toured worldwide and recorded with saxophonists Lou Donaldson and Paquito DRivera. He has played with jazz masters from all styles and eras including Dizzy Gillespie, Mose Allison, Papa Jo Jones, Gerry Mulligan, and Clark Terry. Fuller is among the most sought after jazz bassists in Connecticut. Joe Carter, Guitar.Joe Carter has recorded or performed with Jazz artists such as Art Farmer, Lee Konitz, Cecil Payne, Rufus Reid, among many as well as with Brazilian musicians such as Mauricio Einhom, Robertinho Silva, Luis Eca to name but a few. Graciliano Zambonim, Drums.This Brazilian drummer, composer, has settled in New York, contributing to the rich jazz-Brazilian percussion scene. He has recorded over 30 Albums. Laura Volpintesta, Vocalist. Laura Volpintesta is a highly accomplished jazz singer, her focus over the years has been on Brazillian Samba, Bossanova and Jazz. She has worked with many distinguished jazz musicians in NYC and CT over the past fifteen plus years. Ms. Volpintesta grew up in the arts, and was singing in gospel choirs in NYC by her early twenties. She has recorded as a soloist as well as with several bands.